The good folks at Birlinn Books have offered a copy of the updated version of the superb Tom English book 'No Borders - Playing Rugby for Ireland' for one lucky Harpin On Rugby reader! 1. Read the blurb below. 2. Answer the simple question. 3. Send your name and answer (Subject line > No Borders) to paganoblog@gmail.com before 12 noon on Friday, November 30. Fully updated to include Ireland's historic victory over the All Blacks and their 2018 Six Nations Grand Slam. From Jack Kyle's immortals to Brian O'Driscoll's golden generation, this is the story of Irish rugby told in the players' words. Celebrated rugby writer Tom English embarks on a pilgrimage through the four provinces to reveal the fascinating and illuminating story of playing test rugby in the emerald green of Ireland - all the glory of victory, all the pain of defeat, and all the craic behind the scenes. But this is more than just a nostalgic look back through the years, it is a searing portrait of the effects of politics and religion on Irish sport, a story of great schisms and volatile divisions, but also as story of the profound unity, passionate friendships and the bonds of a brotherhood. 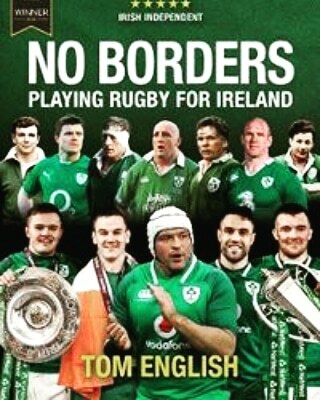 With exclusive new interview material with a host of Ireland rugby greats, No Borders unveils the compelling truth of what it means to play for Ireland at Lansdowne Road, Croke Park and around the world. This is the ultimate history of Irish rugby - told, definitively, by the men who have been there and done it.